Anti-viral effect (particularly against the flu virus). The unique combination of these two acids – fulvic and humic – is found in decomposing plant material, as well as in organic and mineral substances which have accumulated over years and seep out from bituminous rocks, particularly leonardite. Humic acid is a mixture of water-soluble organic substances often found in surface water; fulvic acid is one of its many sub-groups. Scientists have discovered that fulvic acid is made up of tiny fragments of DNA from past generations which have remained intact as if to ensure continuity of life. It may therefore serve as a ‘bridge’ between minerals and living organic matter. Since they have a negative charge, these acids can combine just as well with ‘aromatic carboxyl’ groups as they can with ‘phenolic hydroxyl’ ones. They act as ion exchangers, releasing metal ions of low atomic mass in order to chelate heavy metals. This process helps increase absorption of minerals and trace elements and ensure homeostatic balance. When minerals come into contact with fulvic acid, they combine with them and become bioactive, bioavailable and organic. Fulvic acid is also able to change the molecular structure of water, making it more active and enabling it to penetrate better, thus promoting transport of micronutrients to all cells and elimination of toxins and heavy metals (aluminium, mercury, lead). Humic acid also encourages complete detoxification by supporting the main emunctory organs (kidneys, skin, intestines, liver and lungs) and thorough elimination of toxins, parasites, fungi and heavy metals, particularly in the colon. The result is an increase in energy, an improvement in mood, better quality sleep and a decrease in intensity of arthritic problems. According to various studies conducted by, amongst others, the National Institute of Health, humic acid provides effective support for the immune system and inhibits certain viruses : influenza; herpes (shingles, Epstein-Barr); rhinovirus; and norovirus. 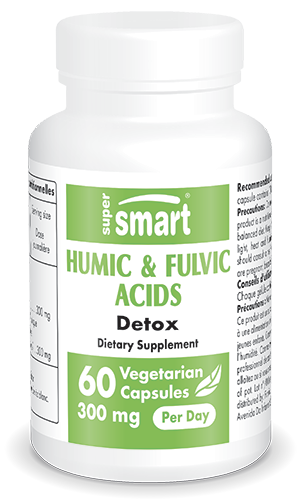 Through its electrolyte properties, fulvic acid is also a remarkable immune modulator. We now know that a decrease in electrical potential (Zeta potential) leads to a general decline in health and premature ageing. As an electron donor and receiver, fulvic acid stimulates electrochemical equilibrium and helps restore the body’s homeostasis. In terms of immunity, it stimulates production of lymphocytes, activates macrophages and NK cells, and induces production of both cytokines (alpha, beta and gamma interferons) and TNF-alpha (tumour necrosis factor). For optimal detoxification, powerful heavy metal chelators are also available in oral supplement form from the SuperSmart catalogue. EDTA (ethylenediaminetetraacetic acid), for example, is known for its ability to bind to lead. There’s also zeolite clinoptilolite, a natural and versatile chelator of several heavy metals. Humic & Fulvic Acids thus represent the missing link in achieving optimal health, with their ability to revitalise the body as a whole by chelating toxins and stimulating overall immunity. Other ingredients: microcrystalline cellulose, stearic acid, magnesium stearate, silicon dioxide. Each capsule contains 150 mg of HumicSure™.